While visiting St. John's again this year, students and faculty from Tikipunga School in Whangarei, Aotearoa's North Island, performed for the community at Kamehameha High School, Kahuku High Hawaiian Immersion, Puohala Elementary, Hakipu'u, and Kamehameha Preschool-Heeia. They not only shared their musical talents but also participated in Makahiki games at these schools as well as with the Ko'olauloa community at Hale 'Ahla in Punalu'u. 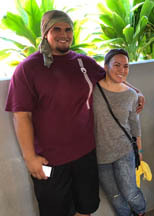 In between times, facilitated by our outreach coordinator Tori, they enjoyed shopping at Ross's, going to the water park, exploring Waikiki, and even cosmic bowling! 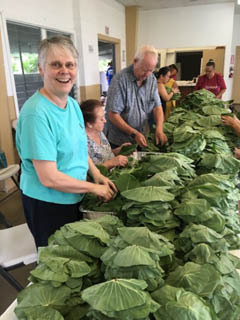 Tori says, "The love and respect from youngest to the kupuna is amazing and unlike anything I've experienced in a long time. 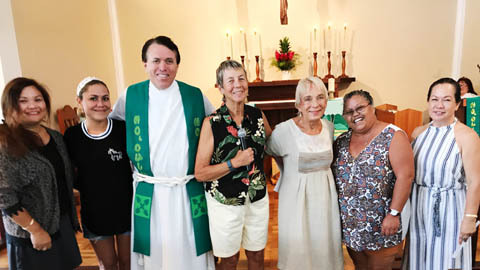 Hosting guests at St. John's has been and continues to be my pleasure--the relationships & connections makes this ministry so rewarding!" 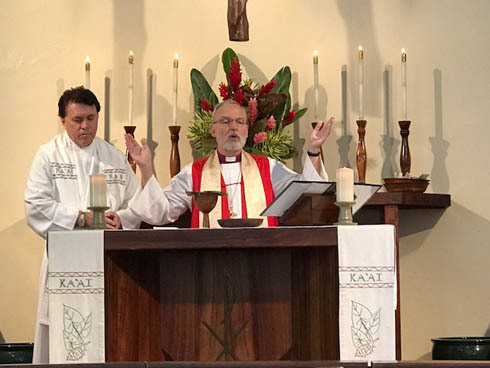 Thanks to Vicki Fay for the photos from our Eucharistic Service on December 10, 2017, when the Whangarei folks sang for us. Fr. 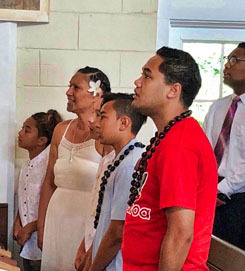 Nahoa, assisted by Luana Fenstemacher, baptized four new members of the church on November 19: Matthew Page Jones, Kamala-Rayne Kehaunani'onalani Kau, Develee Kanani'onalani Kau, and Edward Pau'ahi Kau Jr. Photo courtesy of Ruth Shiroma Foster. Our first craft fair, held in Ho‘okano Hall on Saturday, November 18, was a rousing success! People enjoyed the opportunity to shop, eat, listen (and dance!) to the music, and just hang out and talk story. We also raised money for St. John's programs. 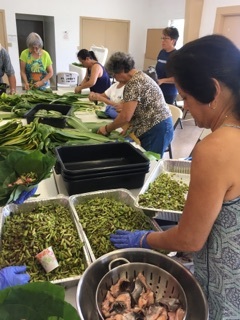 Mahalo nui to all who participated and attended, especially oganizers Kealohi and Kama Naipo! See more photos, courtesy of Vicki Fay. On November 5, the Rt. Rev. Robert Fitzpatrick made his annual visit to St. John's and celebrated the Eucharist with Father Nahoa. 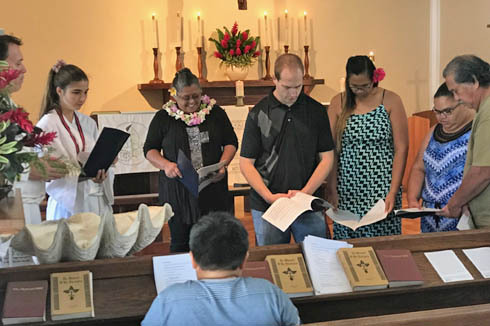 The service was a memorable one, given the community commemoration of the 100th year anniversary of HRH Liliʻuokalani's death in 1917. 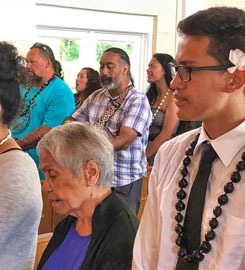 The service was taken from the Requiem mass that was prepared for her funeral at Iolani Palace. Afterwards, members of St. John's hosted Bishop Bob and his wife Bea with food and fellowship in the traditional style of St. John-sians!! Mahalo nui to the delegates who represented St. John's at the annual convention October 20-21, 2017. 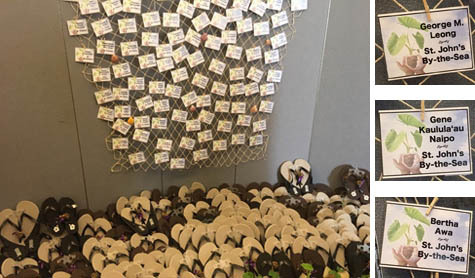 Among the most moving aspects of the gathering was the display dedicated to members who have passed away during the last year and joined the Church Triumphant! We honor their memory and keep them always in our hearts! The 2017 Rev. Darrow Aiona Scholarships recipients are Nicholas Young and William Young (represented above by their mother); Shannon Hisatake; Tori Tualamalalelagi; and Kapono Lucas (represented above by his mother, Kawehi Lucas). The winners were recently announced by scholarship committee members the Rev. Paul Nahoa Lucas, Vicki Fay, and Teena Urban (Aiona). 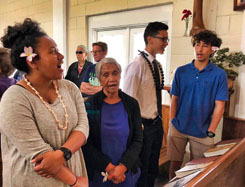 Students from Pomare IV High School in Tahiti stayed in Ho`okano Hall for a week in early April while they were on O`ahu for a cultural exchange. 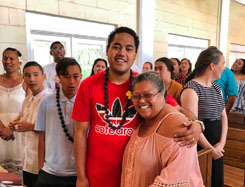 Their leader, Andre Tuarii, introduced to the congregation by St. John's Outreach Coordinator Tori Tualatamalelegi, spoke to and sang for us during the Sunday service on April 9.